Junebug and I watched a film last night on cable movies on demand. I remember when the movie came out it interested me. This movie might not be everyone's cup of tea. It certainly isn't a film that cost a billion dollars to make and is about comic book characters, animation or films geared for male aggressive pleasure. If that is your taste I apologize. I mean no insult. It's just that in this day and my age there are so few films that appeal to my taste. This is sort of a dark comedy/drama. We thought it was great. Richard Gere plays the lead character (Norman Oppenheimer). I thought this was one of his best performance. He should do more character roles. He has the chops to do it. The cast is impressive too: Michael Sheen, Steve Buscemi, Charlotte Gainsbourg, Hank Azaria, Josh Charles and others. RottenTomato gave it an 89% critic rating which is high. Although I could care less what critics say. 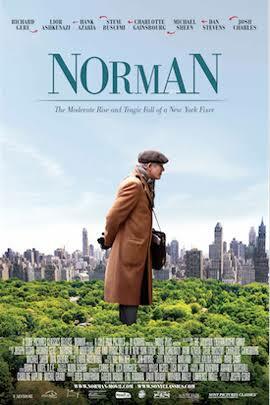 If a movie interests me I'll watch it, just as we did with Norman. Gere delivers an impressive performance. IMDb describes the story : "Norman Oppenheimer is a small time operator who befriends a young politician at a low point in his life. Three years later, when the politician becomes an influential world leader, Norman's life dramatically changes for better and worse (http://www.imdb.com/title/tt4191702/)"
It is an impressive ensemble cast performance, a very curious story line, great cinematography and film editing as well as directing. The ending was absolutely perfect in my opinion. There are a few moments in the film that seem prescient to the lunatic Donald Trump. The film was made in 2016 so someone was a little clairvoyant in the Israeli Prime Minister character. There are many moments when two characters are communicated by phone and the screen juxtaposes both actors side by side. It looks like they next door to each other. I know I'm not explaining it well, but I really was impressed. This is a small little film that delivers on every level. I have a feeling some of you mayfind it boring. We didn't. It was a compelling, piercing, emotional, heartfelt piece of film-making. 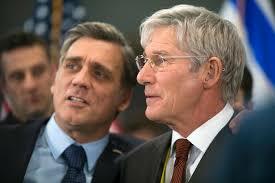 Richard Gere is at his finest (although this is not his only commendable performance)! Jerry and I saw this movie with a friend on our last trip to New York. We all enjoyed it. It was a surprisingly good movie not for the masses. Sure wish they made more of them.